Environmental groups and fishing advocates are accusing the Obama administration of blocking "meaningful public participation" on a plan to protect endangered salmon on a tributary of the Columbia River. The Natural Resources Defense Council, Earthjustice, the Sierra Club and more than 30 other groups want the administration to remove four dams on the Lower Snake River to allow passage for salmon. But they say that meetings meant to solicit input for an environmental impact statement instead leave participants "feeling frustrated and disenfranchised." "[S]o far, the opportunity for public input at the meetings is restricted to submitting typed comments on a small number of computers at the back of the room or through a single stenographer," they wrote in a recent letter. "There is no public hearing. There is no real opportunity for citizen involvement at all." The Snake River once supported more than 40 percent of all spring- and summer-run chinook salmon in the Columbia River basin. Today, the species is in decline, hampered not only by degraded habitat and low stream flows but also by dams that prevent them from getting to spawning grounds. 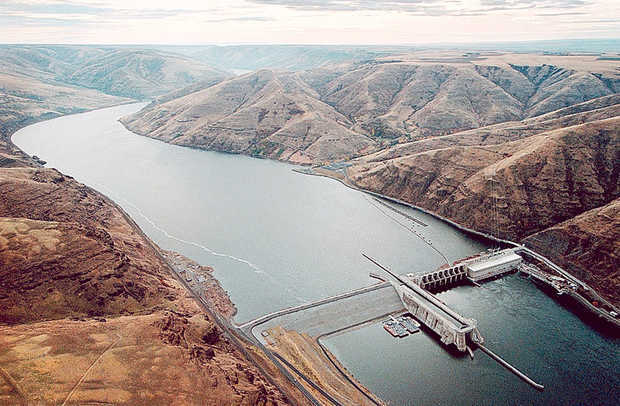 The National Oceanic and Atmospheric Administration has until the end of 2018 to come up with a new biological opinion on operation of the Federal Columbia River Power System, after a federal court rejected the agency's plan to recover salmon in the Columbia River Basin. U.S. District Court for the District of Oregon Judge Michael Simon ruled that the agency had not sufficiently addressed the dams' effect on the fish. This month, the Bonneville Power Administration, Army Corps of Engineers and Bureau of Reclamation are holding scoping meetings in the Pacific Northwest for a related environmental impact statement. But the groups assert that the meetings provide "incomplete and misleading" information that is more akin to a public relations campaign. Among other things, they accuse the government of neglecting to tell the public why it must undertake a new National Environmental Policy Act process. Poster boards, they assert, "fail to explain why a comprehensive EIS is necessary, describe the range of issues and trade-offs that must be addressed and resolved, let alone indicate the kinds of actions that could be considered as components of a reasonable range of alternatives for doing so." The letter asks the agencies to prepare "more accurate" information, allow public testimony at meetings, extend the current public comment period, and add meetings in Alaska and Northern California.